Sipsey Street Irregulars: Sir Philip Sydney: "Me seems I hear, when I do hear sweet music, The dreadful cries of murdered men in forests." Sir Philip Sydney: "Me seems I hear, when I do hear sweet music, The dreadful cries of murdered men in forests." "Me seems I hear, when I do hear sweet music, The dreadful cries of murdered men in forests." -- Sir Philip Sydney, 1554 - 1586, in Fourth Eclogues. St. Bartholomew's Day Massacre, 24 August 1572. 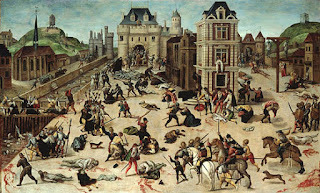 An estimated 3,000 French Protestants (Huguenots) were massacred in Paris and a further estimated 7,000 in the provinces. According to tradition, Catherine de’ Medici persuaded her son, King Charles IX of France, to order the assassination of key Huguenot leaders who had gathered in Paris for the wedding of their leader, Henry of Navarre, to Margaret of Valois, the King’s sister. . . Between 1570 and 1573 Sir Francis Walsingham was the English ambassador to France and Elizabeth I relied upon him to help the Huguenots to negotiate with Charles IX in 1570. Walsingham was in Paris at the time of the St Bartholomew’s Day massacre and his home was actually used as a sanctuary by Protestants, including Philip Sidney. Walsingham and Sidney were lucky to escape with their lives. The St. Bartholomew's Day Massacre started a long and bloody repression of the French Huguenots and sharpened the religious fratricide of Christians on both sides. When we shake our heads at the current slaughters of Muslims of each other (and of all others who don't subscribe to their flavor of Mohammedanism), it should be remembered that Christians killed each other for the right to define who was a Christian and who was not. Elizabethan courtier, statesman, soldier, poet, and patron of scholars and poets, considered the ideal gentleman of his day. After Shakespeare’s sonnets, Sidney’s Astrophel and Stella is considered the finest Elizabethan sonnet cycle. His The Defence of Poesie introduced the critical ideas of Renaissance theorists to England. 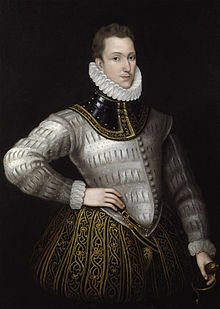 Philip Sidney was the eldest son of Sir Henry Sidney and his wife, Lady Mary Dudley, daughter of the duke of Northumberland, and godson of King Philip II of Spain. After Elizabeth I succeeded to the throne, his father was appointed lord president of Wales (and later served three times as lord deputy of Ireland), while his uncle, Robert Dudley, was created earl of Leicester and became the queen’s most trusted adviser. I thought I knew more than a little about Elizabethan England and its politics, but I recalled nothing about Sidney and thus was intrigued when I found this volume for a buck at a local thrift store: Sir Philip Sidney: The Major Works. Although in July 1585 he finally received his eagerly awaited public appointment, his writings were to be his most lasting accomplishment. He was appointed, with his uncle, the earl of Warwick, as joint master of the ordnance, an office that administered the military supplies of the kingdom. In November the queen was finally persuaded to assist the struggle of the Dutch against their Spanish masters, sending them a force led by the earl of Leicester. Sidney was made governor of the town of Flushing (Dutch: Vlissingen) and was given command of a company of cavalry. . .
On September 22, 1586, he volunteered to serve in an action to prevent the Spaniards from sending supplies into the town of Zutphen. 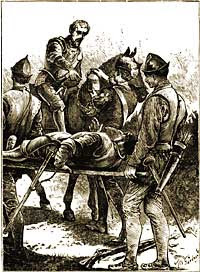 The supply train was heavily guarded, and the English were outnumbered; but Sidney charged three times through the enemy lines, and, even though his thigh was shattered by a bullet, he rode his horse from the field. He was carried to Arnhem, where his wound became infected, and he prepared himself religiously for death. Sidney's mortal wound at Zutphen, the Netherlands. Now, at this time my own ancestors were Dutch Protestants and were then split between Vlissingen, where they were boat builders ("Vanderboegh" means "man from the bow of the boat," and the "boegh," or hawser hole, was what the anchor rope passed through -- we would carve the hole to specifications and then line it with lead, to protect the anchor rope) and Cadzand, where the boat builder's predecessors had been farmers for perhaps a millenium. The second thing that drew my attention was that Sidney was a master of ordnance, a logistician AND a cavalryman of some aggressive enterprise, carrying out several successful raids against the Spanish oppressors. A man, in other words, after my own military interests. (Another interesting coincidence is that my daughter-in-law is descended from French Huguenots who fled to safety across the border in what is now Germany in order to escape the Catholic persecution. 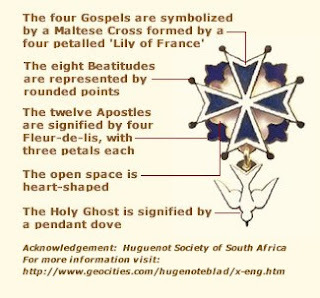 Indeed, my son wears a Huguenot cross tattoo on his bicep in token of that, although when serving in Afghanistan he was required to keep it covered lest it offend some Muslims.). In which sad progress, passing along by the rest of the Army, where his Uncle the Generall was, and being thirstie with excess of bleeding, he called for drink, which was presently brought him; but as he was putting the bottle to his mouth, he saw a poor Souldier carryed along, who had eaten his last at the same Feast, gastly casting up his eyes at the bottle. Which Sir Philip perceiving, took it from his head, before he drank, and delivered it to the poor man, with these words, Thy necessity is greater than mine. And when he had pledged this poor souldier, he was presently carried to Arnheim, where the principle Chirurgions of the Camp attended for him; some mercinarily out of gain, others out of honour to their Art, but the most of them with a true zeal (compounded of love and reverence) to doe him good, and (as they thought) many Nations in him. Sidney was shot in the thigh during the battle and died of gangrene 26 days later, at the age of 31. Sidney's lines at the opening of this piece also convinced me that he knew the essence of evil -- that the Devil most often masks his works in "sweet music," the better to accomplish them. The loss of a worthy man, enabled and qualified every way for the defence of religion, his country and prince, as it is great, so can it not but work much grief in all good minds, especially in those where the bonds of nature and friendship were fast knit and tied. Yet this grief is greatly assuaged when it is well known that the party so well beloved hath received no damage by death, but by many degrees hath bettered his estate: which moves me, being with Sir Philip Sidney for the space of seventeen or eighteen days before his death, and even unto his last breath, to write, for the comfort of those who did dearly love him, a brief note, not of all -- for then I should write a large book -- but of the most special things whereby he declared his unfeigned faith, and special work of grace, which gave proof that his end was undoubtedly happy. After he had received the deadly stroke, being come back into the camp, and lying in a tent, he lift up his eyes to heaven, not imputing it to chance: but with full resolution affirmed that God did send the bullet, and commanded it to strike him. Being told that such sharp correction doth come from God for sin, and that a man so chastised is to humble himself, and to seek assuage in God's displeasure, and to be reconciled unto him: he did not only with fixed eyes upon the heavens confess the same, but also acknowledged it a singular favour and mercy of God, in that He did not strike him dead at once, but gave him space to seek repentance and reconciliation. Hereupon he did not only enter into a deep consideration of those things wherewith he had offended God, but also with great remorse sought how to turn away His displeasure, and to mitigate His anger. The remainder of the long description of Sidney's death was extremely moving to me, but I get enough criticism from the "TLDR" crowd ("too long, didn't read") so I will content myself with recommending that those interested pick up a copy of this remarkable volume. It is well worth the Amazon price. Christians committed violence upon one another in religious strife. Heck, some still do today. However, Islam is a wee bit different in this regard and I offer to you that the difference is stark enough to place your note in the apples and oranges department. I see nowhere in Christianity where Christianity itself is unquestionable. We see Old Testament and New, where in Islam there is only the Koran and hadiths. With Christians, enlightenment and learning played major roles in reformation and, shall I say the still happening update downloads. Islam is quite different on this front, quite different indeed. There can never be a reformation, a new testament so to speak, heck, the most basic of falsehoods within the hadiths and even the Koran itself, obvious fictions and even blatant lies must just be accepted as truth, basically "because Muhammad said so and said allah said so" and umm "Muhammad cannot be wrong". For if Mo is wrong about even one thing, then he could be wrong about more. I would argue this to you Mike V. Whereas Christians have fought over what is right and proper, it is Muslims who still fight, even amongst themselves, for the right to impose their will upon them through the night makes right collectivist ideal. I say to you with great respect that fighting for what is right and fighting for the power to decide what is deemed right are two very different things. Wrong can and does come from the end of a gun, right is right and wrong is wrong no matter who has or doesn't have the guns, or swords or nukes or rocks and sticks. If Christians committed aggression for the power to decide and the ones who believed this won, they would have continued to do so - and not just regarding Christians. So are you saying that side did not win? Puzzling this. That tiny comment there sure sounded like a obamaesque "Christians went crusading" so Christians did it too kind of comment and I reject that absolutely. No, not that Some terrible things have not happened at the hands of those claiming themselves to be Christians but that there is any legit comparison between Christianity and Islam. Not very often do your musings strike a nerve but this tidbit sure did. Maybe it is my own perception, maybe it just didn't come out quite right. No need to explain heck no need to even publish this comment if you don't want to. I just wanted you to know that one meaningless fella took your words to be right in line with Obama as he says look look look Christians did it too! You don't too often come off as agreeing with him and thought you should know it sure came off that way. It seems to me that "Christians have their own history of infighting over what is right and what is not" would be more accurate and avoid the perception I took away from this piece. Your pieces are so good, I hate to see them tarnished - even if only in a mistaken perception by a regular reader. Christians DID do it too...and they were no more "right" despite their *professed* intentions. It is not *right* to deprive others of life, liberty or property and BOTH sides of the Protestant and Catholic (among many other sects of Christianity) schisms did the same....regardless of intent. The road to hell is paved with good intentions as they say and Christianity's book is not the inerrant Word of God and can easily be proven so, from later additions to the text itself to the fact that we don't have evidence of the actual first writings of any of it until, at the closest 115 or so years after the fact (and that's only on the New Testament/Brit Hadasha side of the equation...the DSS are 2C BC at best meaning if one is to believe the Biblical time frame for the OT, you must acknowledge that there's something in excess of 5800 years of time between the DSS and the oldest complete Torah examples). Faith is what it all boils down to....but you cannot rationally decide your faith is better than anyone else's based on the historicity of the texts themselves. Yes, the Crusades were a result of MUSLIM INVASION of Europe and European Christians have unfairly been saddled with a yoke of blame that is history re-written, but let's not fall for the same tactic and try and re-write the WRONGS committed by so-called "Christians" in the name of our Messiah and the Father. Great article. It should be noted that at the rise of the French Protestant movement, they idea first spread among the upper class and then filtered down to Acedemia. The French Wars of Religion were as much about class warfare as it was about who gets to talk to God. Philip Sidney is one of my favorites from Elizabethan times. Warrior, poet, gentleman - he had it all and died too young and very painfully. Sir Francis Walsingham was, of course, Elizabeth's spymaster. Great bargain book find, Mike. I look forward to hearing about how Christians embarked on a plot to subjugate as inferior every person on the planet, by forced coversion or death as their book, their unchangable and unquestionable book demands. 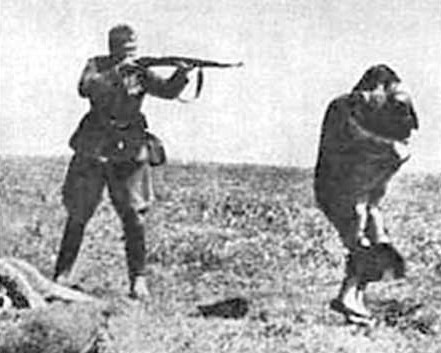 To say Christians have committed horrible acts is one thing - to say they "did the same thing" is another. Islam has been the same since the start. But hey, if it makes people feel better to say "they did it too" then have at it. Like Slavery, how long before people stop pointing at those who did it too (even if intent and reasoning is or isn't even similar) and point to those still doing it instead? Everyone looks better in an Elizabethan collar! I am descendant from aristocratic French Huguenots, of noble blood. Four-hundred years later the hatred of the, let me put this as diplomatically as I can, the Roman authority is keen in many of my living cousins. The Wars of Religion are not well understood, even by some of your commenters who cannot know the depths of the nuances from reading a wiki article or even taking a history class (although that would be beneficial). Religion literally means "to tie back" or "old" or "constrain". It implied adherence to a strict code of behavior and thought. In the case of Christianity, which is inwardly oriented, to the individual not to "classes of person", this tends to the K-selected desire for government by consent and merit, not dictatorship and tyranny. The Italian Mediccis were the banksters of the Renaissance. They gained their influence the old fashioned way: they bought it. As with today's banksters, they sought to control the lives of the masses and successfully installed four of their own as "popes" in the church, with the expectation of keeping their bankster empire well fed. When French nobility and aristocracy objected to the criminal enterprise that was the Church of Rome, the Medicci crime family responded as would any other crime family: private warfare, eventually becoming state-level warfare through their puppets who ruled only with the blessing of the Medicci's family popes. To somehow dismiss this righteous fight against an evil family and corrupt institution is to side with all that is wrong with human nature. Many nominally Roman Catholic nations, mainly along the old Roman frontier, were (and are) by nature meritorious and republican in managing their affairs in the basic manner of the American colonists of 1776. For example, apart form the known Anglo-Saxon ways, Lithuanians had a functional constitutional government -- without an actual king -- for many years before subjugation by German and Russian attacks. The Huguenots and kindred Reformed Dutchmen played a great role in the colonial and Federal era of America, all along the Hudson River Valley where so much of our American history was created. Obviously, the Wars of Religion had nothing whatsoever to do with the teachings of the greatest teacher, Jesus of Nazareth. They had everything to do with pillaging and featherbedding, squeezing the "little people", including the previous ruling class, of every ounce of gold possible. In other words, the Wars of Religion were a righteous response to blatant corruption of the kind we complain about here and everywhere in the Threeper, patriot, paleocon, neo-masculinist, and orthodox Christian communities who are doing their best to undo the centuries old destruction of the Mediccis. It is not an exaggeration to say many of our present woes were birthed by that evil family. Much good eventually came from the Wars but the price was indescribable suffering and loss. It very well be as expensive today, our fight to rid ourselves of our current crop of evil, wicked, ruthless Mediccis in Manhattan, "The City" of London, and of course our own cesspool of corruption, Washington, District of the former Columbia. Learn from history and improve on its mistakes!